Can we make changes in uk visa new application form for reapplying for tourist visa after refusal of visa? Do they compare previous application with the new application? My college letter clearly says that i am enrolled in 4 years program and he has completed 3 years and 1 more year to go.I will also attach my exam results to prove the number of semesters i have cleared. 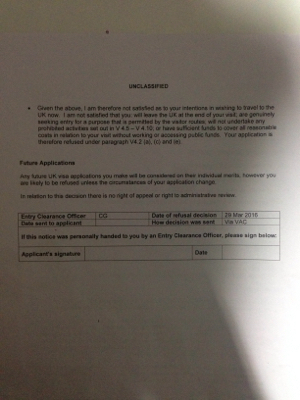 The letter also says that i want to travel to uk during my vacation as the college is having holiday from 2 june to 4 july 2016 and the college has no objection. I have also attached bonafide letter from college. My Father has savings of 2900 pounds and mother has savings of 1600 pounds. I have a joint account with my father worth 1500 pounds and we are also showing my fathers fixed deposits worth 12000 pounds. And public provident funds worth 5600 pounds in my name,fathers and mothers name combined.That should be enough? Second dot point: she explains that he is a student with GBP 1k to spend, but she doubts his financial capacity is sufficient and notes that he did not provide sufficient evidence (standard text for student applicants). Last dot point: based on all of that she thinks he will go underground and try to live in the UK (V 4.2 (a) & (c)) and moreover will become reliant on public funds (V 4.2 (e)). Text straight from the manual. Can you change the application so that it is different from a previous refused application? Yes, that's what they want people to do. Part of your refusal notice says that your next application will fail unless there's a change in circumstances, so it's important to emphasize those changes. Is your new evidence going to work? This, like many visa questions, calls for an opinion. Mine is that your next application will fail also. Granted you are presenting some new evidence but it is not a change in circumstances. Your situation is still the same as it was in your previous application. I.e., you're a student in reduced circumstances with few apparent ties to India and who is reliant on two co-sponsors. Your flight tickets will require the depletion of about 10% of your entire family's liquid assets. This is outside of the feasibility range. The ECO already noted that this was disproportionate and providing more detail about the individual balances does not make it proportionate. In the event you need more, your family may need to liquidate their fixed deposits/provident funds and because of this, ECO's are reluctant to credit them. You have a letter from your school stating that you are a student and they have no objection to your travelling during their break. The chances are good that they already checked this out on your previous application to be sure you were not deceiving them (Indian consulates check everything). And if the ECO determined that such a letter would save the application and prevent a refusal, they would have contacted you or they would not have refused (it's really not an adversarial process). You were refused on V 4.2 (a) + (c) + (e) which means you fit two profiles (1) go underground and try to live in the UK; and (2) eventually become reliant upon public funds. You need to fix two hard misconceptions they have about you and your new evidence does not do much to fix them. Sponsored applications make the very weakest case for an ECO; sponsors can pay for your tickets but neither your father nor your cousin nor your school can prevent you from going underground if you opt to do so. Your question history here on TSE indicates that you are experiencing some anxiety about your fresh application and while I sympathize with the need to 'clear one's name', doing it in a hurry can make matters worse. Consider waiting until a more prosperous time. Note: This is the first answer to your question, it's best to wait until all the time zones have had a chance to put in more answers. There's more information about capacity and apparent lifestyle here: Should I submit bank statements when applying for a UK Visa? What do they say about me? Not the answer you're looking for? Browse other questions tagged visas uk visa-refusals standard-visitor-visa or ask your own question. 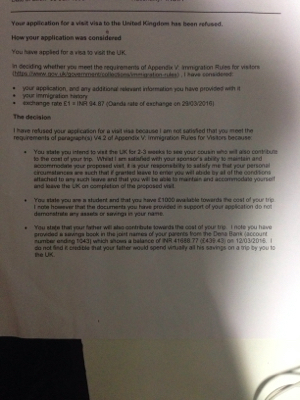 My UK Visa was refused. Can I change the details about my circumstances in my next application? Application for UK Special visa (Attendant for Medical Treatment) twice refused, planning to apply for Third time?